Sustain pedal is worn through with overuse. Img_3803 by Terencewei via Attribution Engine. Licensed under CC NC. 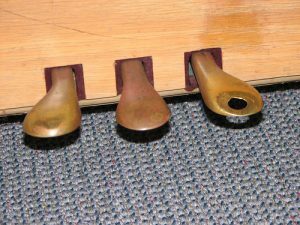 Even though all three piano pedals do something different, most pianists tend to use just one: the sustain pedal, also called the damper pedal. This pedal makes the keys echo with a ringing tone, sustaining the sound even after you let go of the keys. It adds a rich and beautiful quality to the sound of your music. We use this pedal so much more than the other two that we tend to just call it “the pedal.” You’d think that with so much favoritism, pianists would be really good at using the sustain pedal. The truth is, there are several common mistakes that pianists make with the damper pedal. If you want to know to how to use the sustain pedal, you have to know what mistakes to avoid. Here are some of the worst offenders and what you should do instead. When playing piano, you’re probably paying more attention to your fingers than your foot. If you’re not paying attention to your foot, you risk making all the following mistakes. The sustain pedal gives the music a rich, ringing echo, so you should use it all the time. Right? Wrong! While some pieces of music need the pedal most or all of the time, many only call for it in certain places. Some don’t even need the pedal at all and would sound genuinely bad if you were to use it. What to Do Instead: Respect the integrity of the music, and don’t overuse the pedal. If you don’t use pedal where you should, your music will lack some of the finer elements of sound. Your fingers may sound technically correct, but you’ll lose the proper feel for the song. As an example, Clair de Lune wouldn’t sound nearly so smooth and elegant without the pedal. What to Do Instead: Since the pedal DOES give the music a beautiful ringing echo, you should take advantage of it more. Use it when appropriate to add to your sound. “Clearing” the pedal is what we call it when you lift and depress the pedal again. Some amateur pianists never lift their foot, so the pedal is never cleared. Others don’t lift their foot often enough, and the sound of previous notes carries over through the next musical phrase and makes it all sound muddled. Most offenders only lift their foot part of the way so that it partially “clears” the pedal. What to Do Instead: Clear the pedal completely every time by lifting your foot high enough that the pedal reaches the top of its hinge before you press it down again. You don’t have to pick up your whole foot every time you clear the pedal. Doing that is an awkward movement that is sure to put you on edge and affect the sound of your playing. You’re also making it harder on yourself. What to Do Instead: Keep your heel on the ground with the pedal under the ball of your foot (closer to your big toe, where you have more control). Every time you need to clear the pedal, all you have to do is lift the front of your foot while keeping your heel on the ground. This keeps your pedaling smooth and controlled. Pedaling early leaves a gap between the previous notes and the next ones. This gap sounds almost like a musical “stutter,” or like your sentence has been cut—-off in the middle (like that). This is a VERY common problem among beginner to intermediate level pianists; in fact, the vast majority of piano students seem to go through this phase before learning to time it just right. What to Do Instead: Some suggest you should clear the pedal right before you press the keys, but that still leaves a disconnect or gap in the sound. Instead, quickly clear the pedal at the same moment (or almost a hair AFTER) your fingers press the keys for the next chord/phrase. Pedaling too late does the opposite: it carries the sound from the previous phrase or chord into the next one. This makes your music sound “muddy” or muddled. You lose the clarity of sound, and you lose track of the melody, harmonies, and chords. What to Do Instead: Again, quickly clear the pedal at the same moment (or just a HAIR after) your fingers press the new keys. If your foot is taking a whole beat or even half a beat to clear the pedal, you’re pedaling too slowly. This also creates gaps in the sustained sound. Using the pedal seems so simple, like pressing a button–and yet, as shown here, it’s not. Just like every other part of studying music, the pedal takes practice. Too many pianists ignore this. What to Do Instead: You have to practice when to use it, when not to use it, and how to use it properly in order to become skilled at using the pedal. What to Do Instead: While they’re learning their pieces, I always have my students perform for me both with and without the pedal. I also have them practice without the pedal at home. The music doesn’t sound quite as rich and full as it does with the pedal, but if you’re playing well with your fingers, the music should otherwise sound just as beautiful. Stripping away the pedal during practice can help you discover areas you didn’t even know needed improvement. Left image: This hand-over-hand arpeggio passage is written to be played with the pedal. Holding the Left Hand 4 and 5 fingers down is a common mistake; they’re weaker fingers and tend toward laziness. I see this all the time in piano lessons. But if the composer wanted you to hold down those notes, he or she might have written it to look something like the image on the right. There is a difference when you lift your fingers vs. when you hold them down. 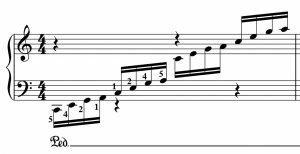 As you become more advanced in studying piano, your trained musical ears may gradually begin to detect an audible difference in the way these two passages sound, even when you’re pressing the pedal. See the rests in the Left Hand between the first and second Pedal marking? This means that the pianist should release the LH fingers from the keys, but continue to hold the pedal. This will create a different sound than if the LH were to linger on these keys through the rests. What to Do Instead: Remember to lift your fingers when the music tells you do, and practice without the pedal to make sure you’re doing it right. If you don’t practice without the pedal, you don’t become aware of these distinctions as early in your musical study. The most important takeaway from these two examples is that an experienced musician can hear the difference, and the composer wrote it that way for a reason. It’s really tempting to be lazy with the pedal. Since the sustain pedal causes so many notes to resonate at once, it’s easy to let your fingers become sloppy with their technique. Many pianists don’t even realize how lazy they’ve become because they’re not really listening to themselves when they play. But an experienced musician will always be able to tell when your technique is clean, even through the guise of the pedal. Actually, believe it or not, most listeners can tell a difference! What to Do Instead: Listen. Always listen. If you’re concentrating so intensely on reading the music and playing the right keys that it’s too hard to listen, then you need to keep working on the piece until you know it better and it becomes easier, more like second nature. Listening is an essential skill for every musician. It’s hard for the pianist using the pedal to hear these mistakes. Usually you’re focusing so much on reading the notes that you aren’t listening critically to yourself, or you’re making the first mistake of not paying enough attention to the pedal. If you’re making any of these mistakes and you’re not very good yet at using the pedal, don’t let it discourage you. Skills take time! Take this opportunity to critically analyze your pedaling technique, follow these tips on how to improve, and you’ll become a much better pianist and musician. Ask your piano teacher for help or sign up for piano lessons to get expert assistance in improving your technique. Without clean pedal technique, your music will never sound as good as it could. But when you know how to use the sustain pedal correctly, it will transform your performance and allow your music to transcend to greater heights.